Robust Measurement of Nano-structures in Milli-seconds! InFoScat is an acronym for “Industrial Fourier Scatterometry", which is a Eurostars project (E8875) started in 2014. The partners for this project are Image Metrology A/S (Denmark), Danish National Metrology Institute - DFM A/S (Denmark) and ELDIM S.A. (France). 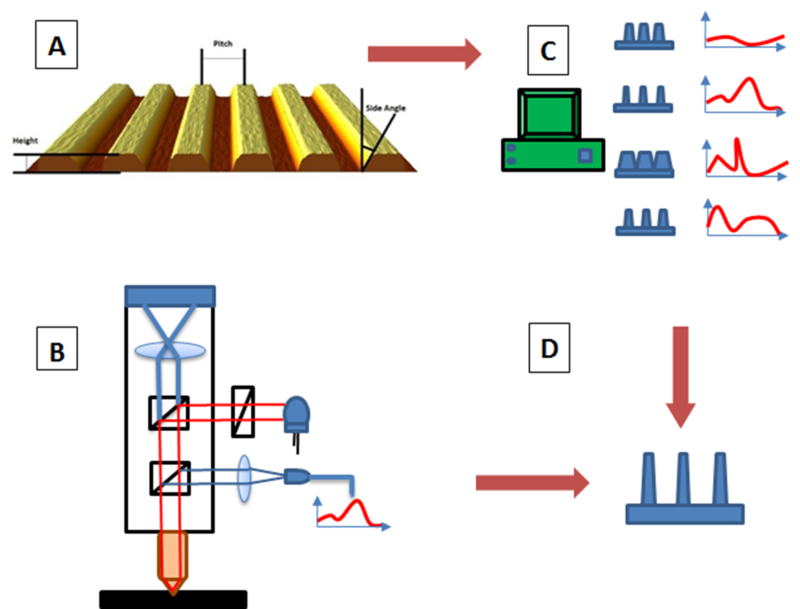 The aim of the project is to create a fast tool for measuring critical dimensions of repeated micro and nanostructures and light emissive displays that is well suited for inline quality control in industrial production environment. ELDIM is taking care of the hardware by developing a new unique Fourier lens optical system that will unlock the potential of scattered light characterization in production environment to give direct feedback to manufacturing processes like injection molding. DFM is responsible for the development of software algorithms that can calculate the geometry of nanostructure based on the scattered light analysis. Image Metrology is implementing the algorithms in a user-friendly software package. The software will be bundled to the Fourier lens system developed by ELDIM, but will also work together with existing spectroscopic scatterometry and spectroscopic ellipsometry systems. The InFoScat software is now available for download and comes with test files and can be use on your own data if you have an applicable scatterometry or ellipsometry system. Provides quality control and assurance capabilities. Applicable in industries for emissive devices (flat panels), semiconductors, structured colored plastic, self-cleaning surfaces, solar cells etc. Patented technology - US patent 7,321,433 (2008). Height, width, independent left and right sidewall angles. Pitch, Height, width and sidewall angles / complex sidewall form. Pitch, Height, width/length/radius, sidewall angles / complex sidewall form. You can also use the InFoScat software as a design tool for nano-structures meeting optical criteria within a selected wave length. InFoScat is governed by the principle of scatterometry. A periodic structure diffracts light into diffraction orders. 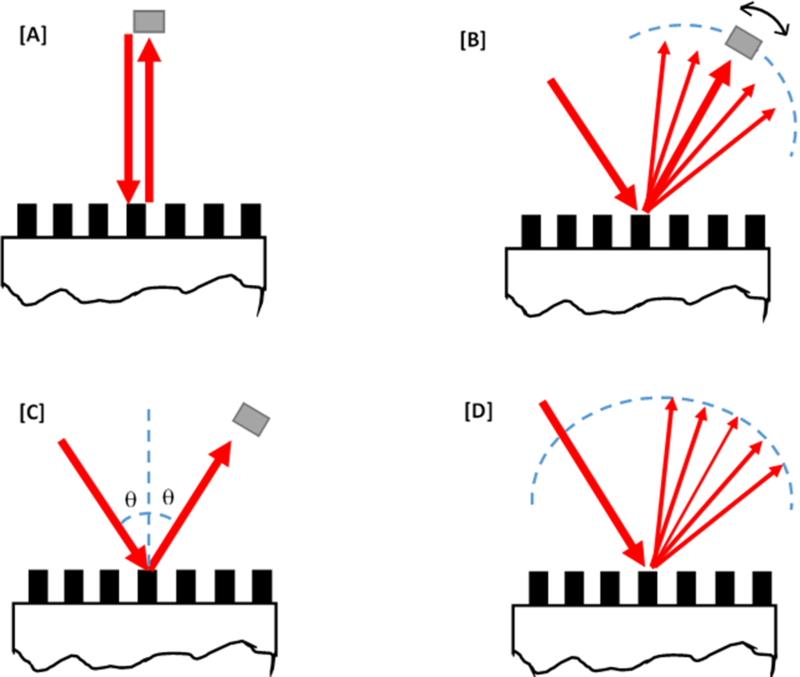 Scatterometry is a characterization technique where the intensities of diffraction spots are used as a ‘fingerprint’ to describe the surface. One can also measure the wavelength dependent diffraction efficiencies. For the analysis an inverse modelling approach is used, where computer simulated model database is compared to the experimental data. Scatterometry analysis consists of following steps as described in the figure below. 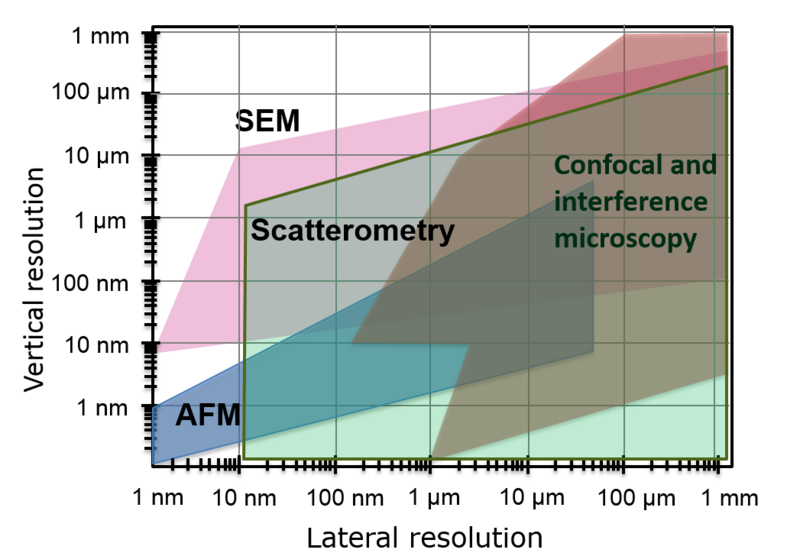 (A) A sample with unknown dimension to be characterized is placed in a combined microscope, and scatterometer. (B) The reflected light is analyzed by a spectroscopic scatterometer. 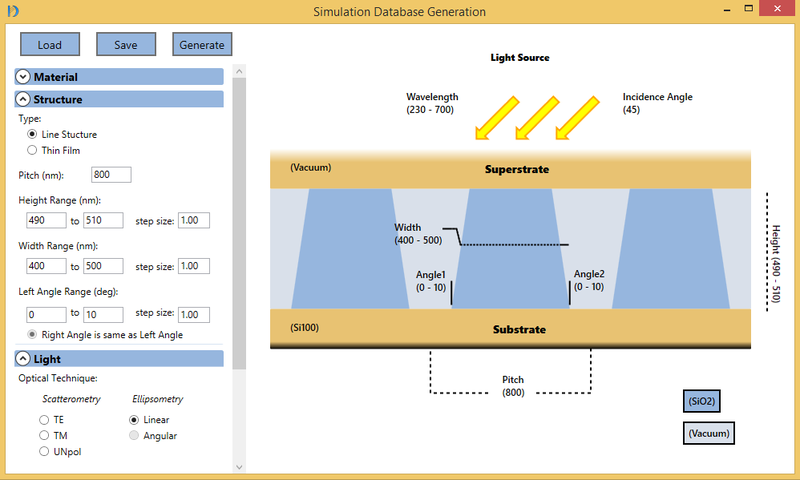 (C) Simulation database generation - computer simulations of the diffraction efficiencies are stored in a database. Using a database approach makes the inverse modelling extremely fast. (D) Database comparison - the measured diffraction efficiencies are compared with the simulated data and the best match gives the dimensions of the structures of the sample. The InFoScat software uses stable algorithms based on rigorous coupled-wave analysis (RCWA) for solving Maxwell’s relations. The user has to specify possible ranges of representative geometric parameters, such as height, width and sidewall angle, to describe a given pattern. With RCWA a structure is divided into slabs and the electromagnetic fields at each boundary is matched. 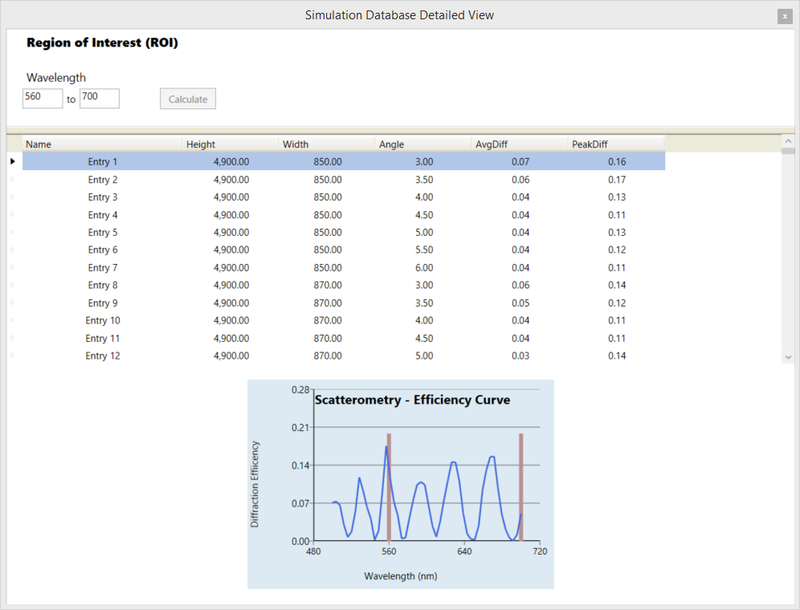 Screen dump of the InFoScat software interface for generating the simulation database. Here a grating is described with possible ranges for height, width and slope angles. The applied optical technique is Spectroscopic Ellipsometry. Using a pre-generated simulation database it is extremely fast (typically only a few milliseconds) to find the simulation fitting the measured spectrum best and thereby deduce the geometrical dimensions together with confidence intervals. 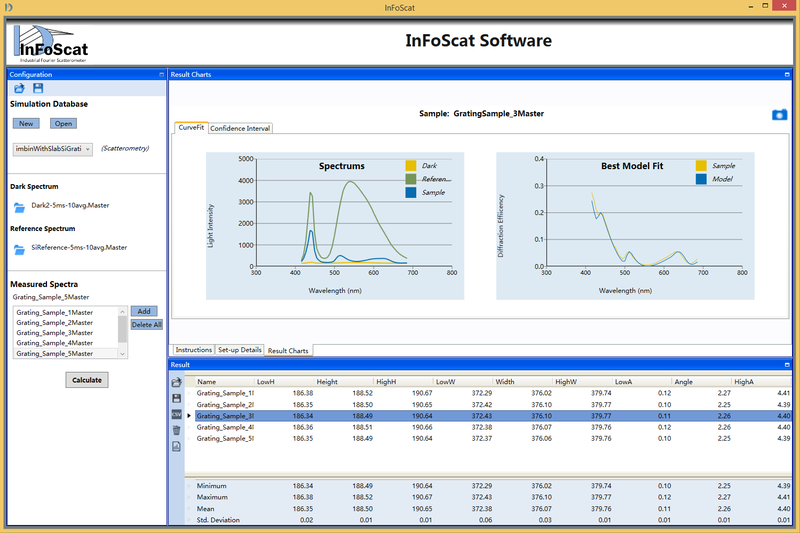 Screen dump of the InFoScat software interface for simulation database comparison results. Here the result shows the estimated height, width and slope angles for every sample, along with 95% confidence interval ranges and statistics of measurements. The samples are measured using Spectroscopic Scatterometry optical technique. typically using a coherent light source. at a specific angle of incident. The best solution for low pitch measurements. orders with an azimuth angle up to 75 deg. signal can also be measured. The most practical instrumentation for diffractive structure. 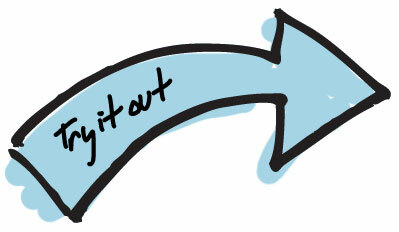 You are most welcome to download a try the software your self. There, will be reduced accuracy and limited functionality without having a license, but you should get a good impression of the capabilities and workflow. Industrial Fourier Scatterometer (InFoScat) is a Eurostars project (E8875). The partners for this project are ELDIM S.A. (France), Image Metrology A/S (Denmark) and DFM A/S (Denmark). 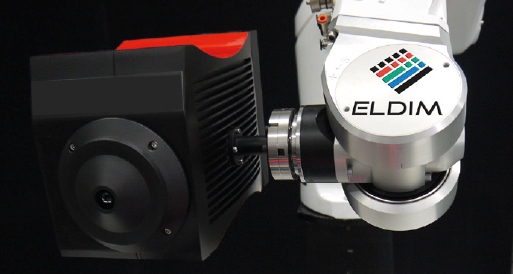 ELDIM (www.eldim.fr) has been involved in optical metrology since 1991. ELDIM's market is mainly in the liquid crystal displays and the flat panel displays field and 80% of their turnover is made outside France. ELDIM's products are used for research and development needs as well as being included in production lines. The product line includes systems for viewing angle measurements, for imaging measurements and temporal measurements. Additional products for display driving and calibration purpose are also available. Image Metrology A/S (www.imagemet.com) is a software company founded in 1998 and possess competences within image and data analysis software for microscopy.IM’s main product is the Scanning Probe Image Processor™ (SPIP™) originally designed for Scanning Probe Microscopy (SPM), for example AFM, but now also used together with other imaging techniques, such as Scanning Electron Microscopy (SEM) and optical microscopy. 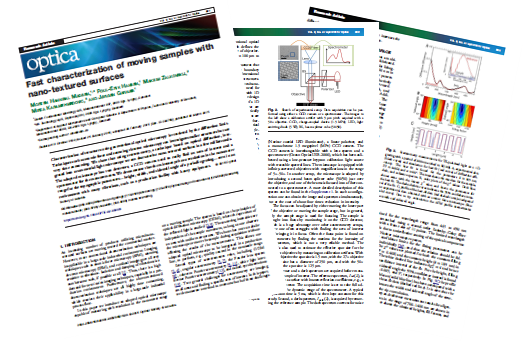 SPIP is widely used among academics and more than 800 papers with reference to SPIP™ has been published. IM has developed a number of unique image correction algorithms that corrects for systematic and stochastic artifacts typically found in high magnification microscopes. DFM (www.dfm.dk) is the national metrology institute (NMI) in Denmark. DFM maintains several primary standards, including the meter and kilogram, for calibrations with the highest possible accuracy. DFM is participating in many national and international research projects (16 projects in 2013) of which, several includes optical characterization of nano-textured surfaces (4 projects in 2013). DFM is known for excellence in modeling, measurements and consultancy within the field of scatterometry. DFM has several homebuilt scatterometers and has developed algorithms for modeling scattering intensities; with many peer-reviewed papers published in recent years (complete list can be found in DFM's annual reports available here. © 2015. Image Metrology A/S. All Rights Reserved.